OCR Position for 2015 Summer Internship Program. See PrideCMS listing for desired majors and degrees. OCR Position for Emerging Leaders Program. See listing for desired majors, class year, and degrees. OCR Position for Elevate: PwC's Leadership Program for Summer 2015, Start IFS Summer Intern 2015, and Winter 2016 Tax Intern position. See each listing for desired majors, class year, and degrees. OCR Position for full-time Financial Advisor. See listing for desired major and degrees. Kick off Spring Semester with the Career Center! Stop by our table to meet the staff, grab some FREE Starbucks coffee, snacks and give-a-ways, and book an appointment on the spot to prepare for your job and internship search! Commercial Lending; SBA; Real Estate; Cash Management; Consumer Lending; Residential Mortgage; FICO scores; Credit Reports; Home Equity Loans; Retail; Government Banking and Personal Wealth Management. Students must submit a resume and an essay regarding interest in commercial banking by the deadline listed above. A total of six students will be selected. If desired, 1 credit can be obtained through registration in Finance174. Open to Zarb students only. Learn how to build your “personal brand” from students who have succeeded in getting internships, to stand out in the application process yourself! Topics include: LinkedIn and social media, networking, business etiquette, interviewing, and resume tips. Food and beverages will be served! For over 35 years, The Washington Center for Internships and Academic Seminars has helped more than 50,000 students from around the world gain valuable experience, and set them on a course of achievement, leadership and engagement in their communities. In a recent survey, 98% of TWC interns said the program significantly strengthened their career prospects. Now, their alumni are leaders in virtually every field -- public service, journalism, business, law, medicine, education, and more. If you are interested in learning what this program has to offer, come to this information session open to all students. Are you looking to get your foot into the business door? Grant Thornton LLP, one of the world’s leading organizations of independent audit, tax and advisory firms, is looking to help you gain that exposure! Join Grant Thornton representatives on a visit to their Manhattan location to gain an overview of the firm, shadow a Grant Thornton employee, and explore what opportunities are available to you. First-year students/Sophomores of any business major and Junior/Senior Accounting students are invited to attend. Space is limited to 40 students. Transportation and lunch will be provided. Open to Zarb Students only. A panel featuring professionals and students will discuss what career fields you can qualify for based on your Zarb major, and give tips on which internships are the best fit based on your goals. Food and beverages will be served! Looking for a full-time, part-time, summer, or internship position? The Career Center's Spring Career Fair is open to all Hofstra students of any major and class level. Students are encouraged to attend in order to meet with employers from multiple industries who are looking to hire for a variety of positions. Professional dress is required. A professional photographer will be available to take LinkedIn profile pictures. Please bring copies of your resume. Students may attend the Career Center's Quick Question Hours any day prior to the fair for a resume review or for tips on how to make the most our of your fair attendance! 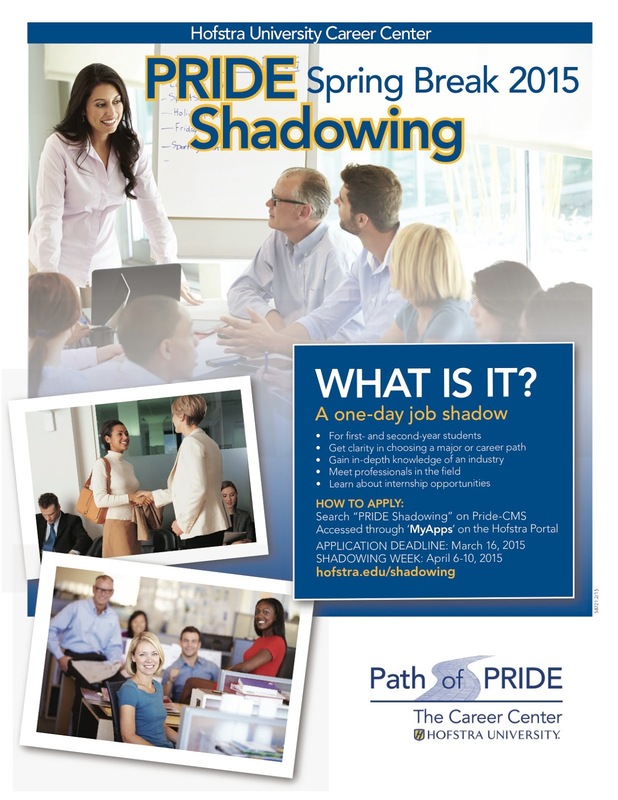 We are proud to announce that we are now accepting applications for our brand new shadowing program! If you need help choosing a major or exploring careers, this program is for you! Check out hofstra.edu/shadowing to find out more! proper networking and conversation etiquette. 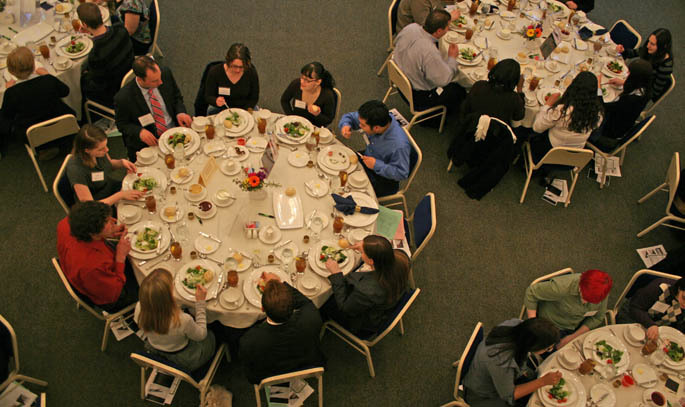 There is a $10 fee, which includes the seminar and three-course meal. Space is limited; Fee/RSVP can be submitted to The Career Center to reserve your seat.